St. Brides Correctional Center is a level 2 medium security facility located in Chesapeake Virginia. 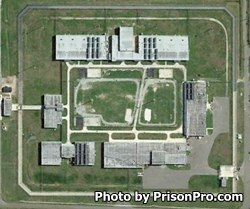 This prison opened in 1973 and has received several upgrades and additions over the years with the latest occurring in 2008. The facility is comprised of 14 housing units that can contain a maximum of 1,192 adult male inmates. Inmates are divided into three types of populations; general population, cognitive community and restrictive. Inmates at St. Brides Correctional Center are provided the "Matrix" substance abuse treatment program, victim impact, and thinking for a change programs. Additionally, offenders can participate in educational courses, technical training, and apprenticeship programs. All visits need to have an approved visitors application on file before they can visit an inmate. Visits at St. Brides Correctional Center occur on Saturdays and Sundays and are on a rotating schedule, contact the facility for the current rotation.